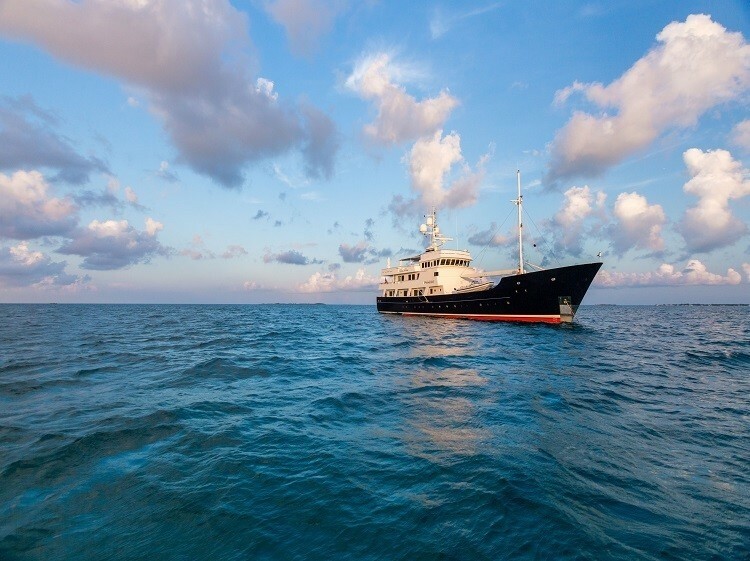 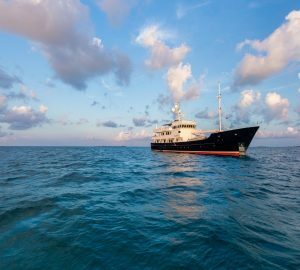 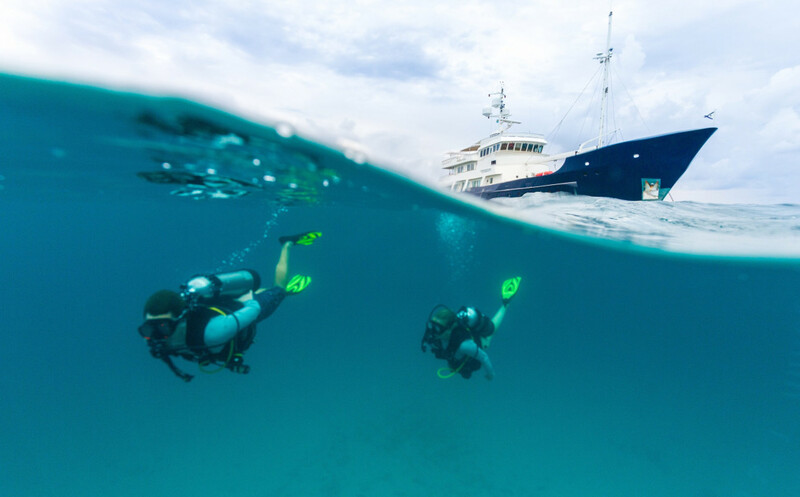 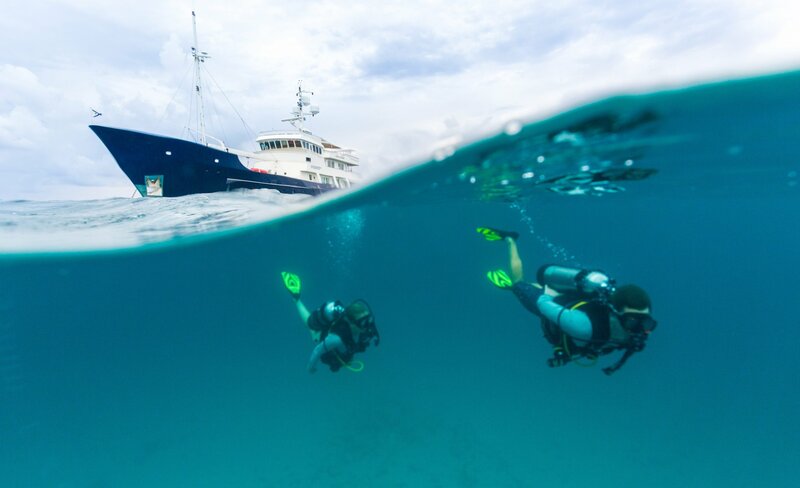 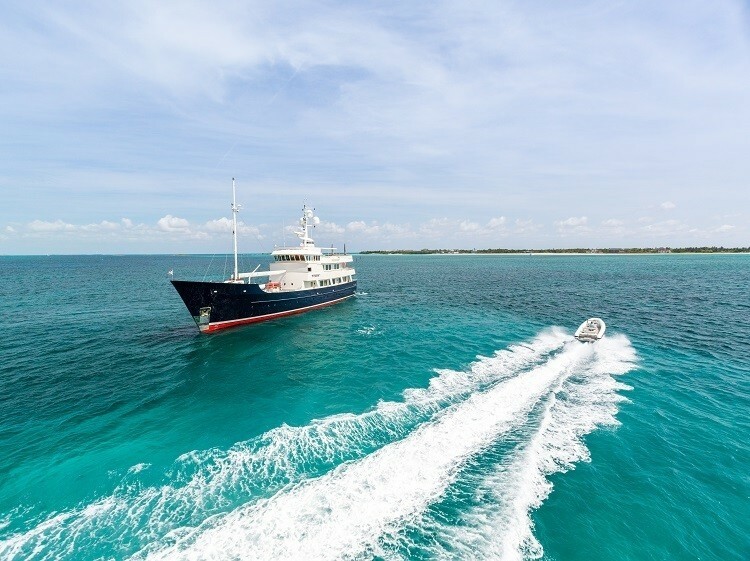 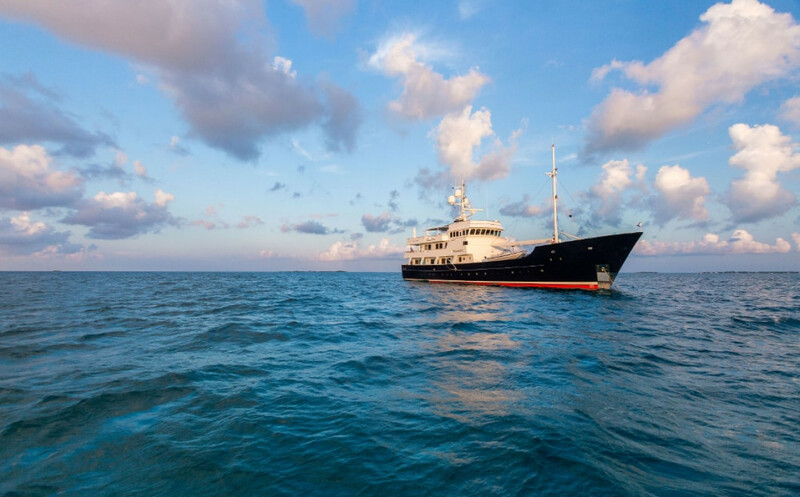 PIONEER (ex Putty VI, Turmoil) is an exceptional charter yacht built by Palmer Johnson in 1996 and is one of Vripacks most famous designs - recognized as the first ever specifically designed Expedition Super Yacht. 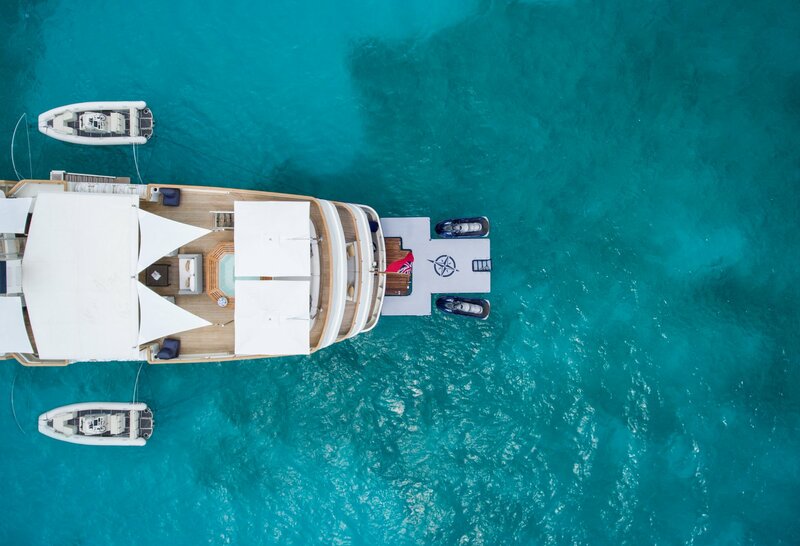 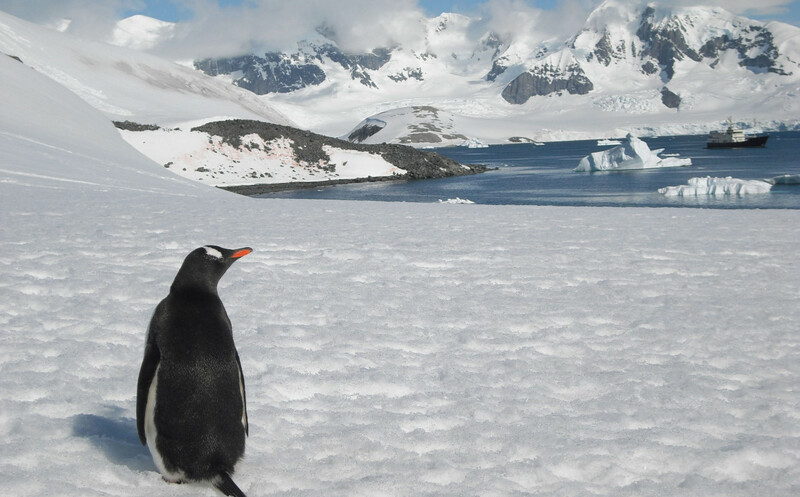 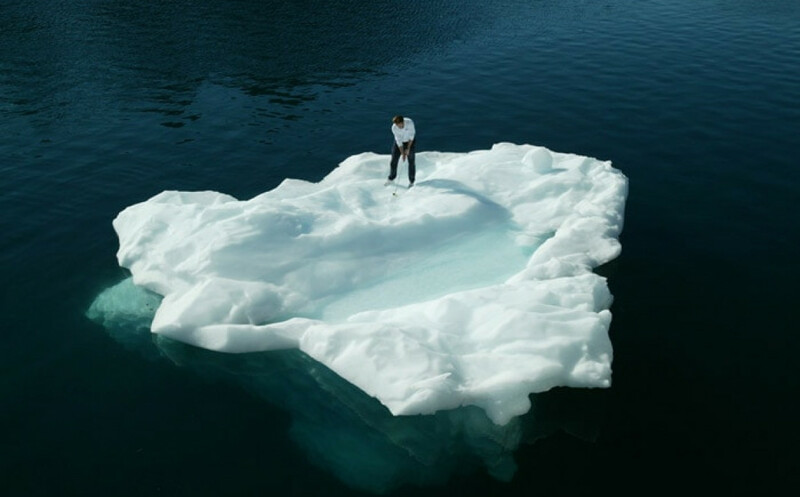 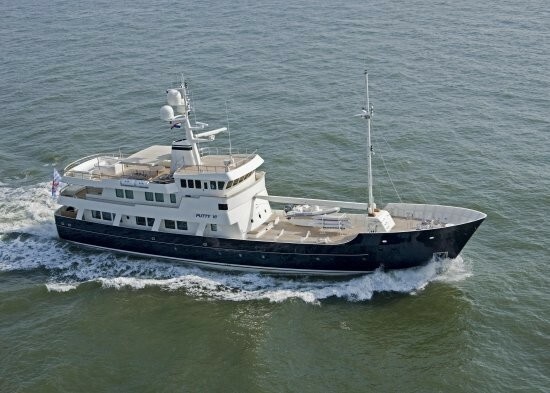 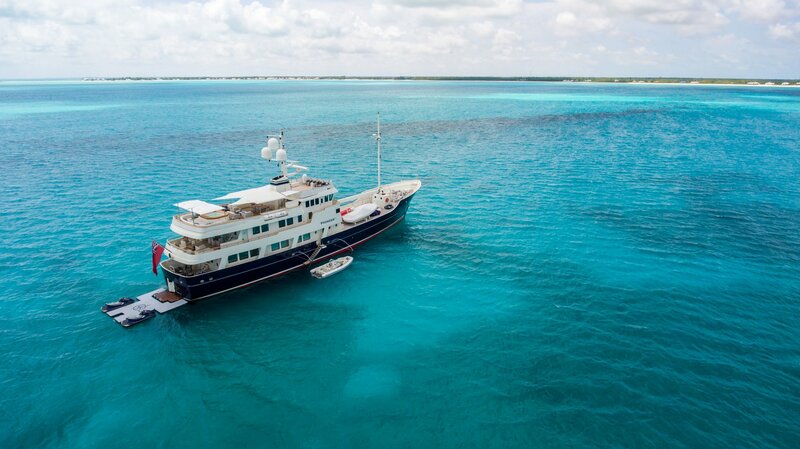 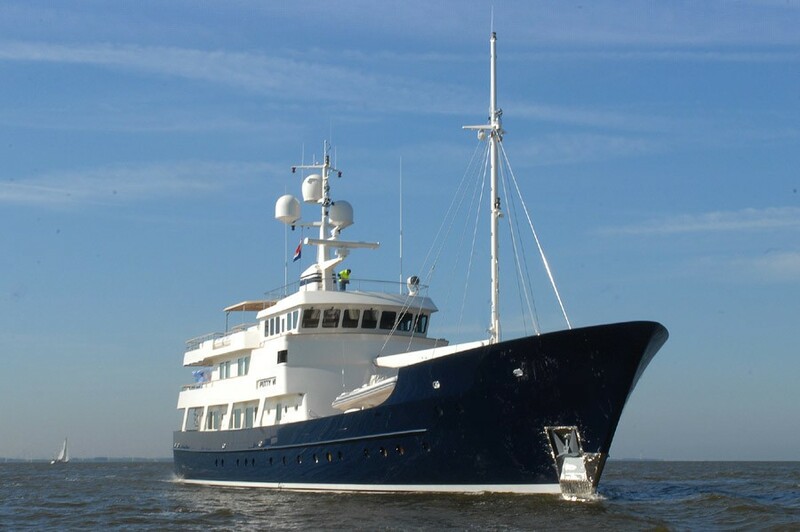 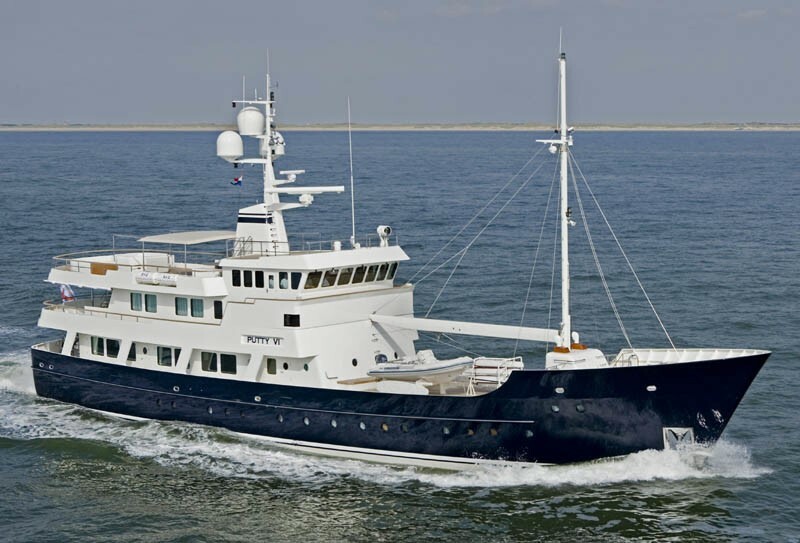 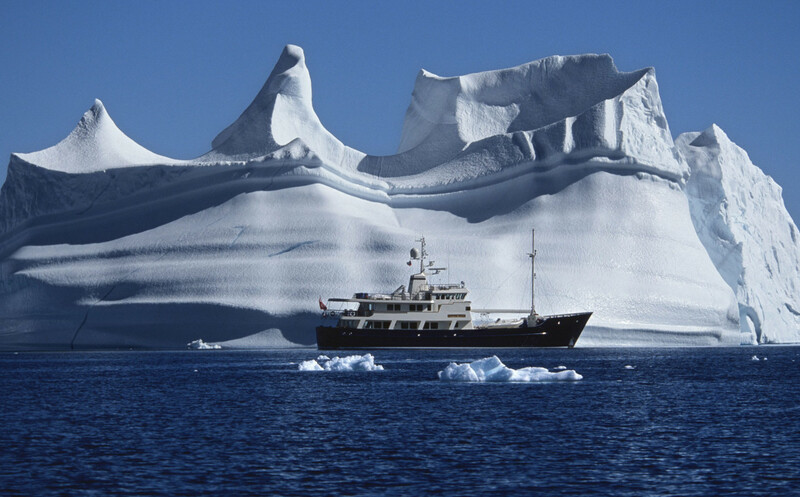 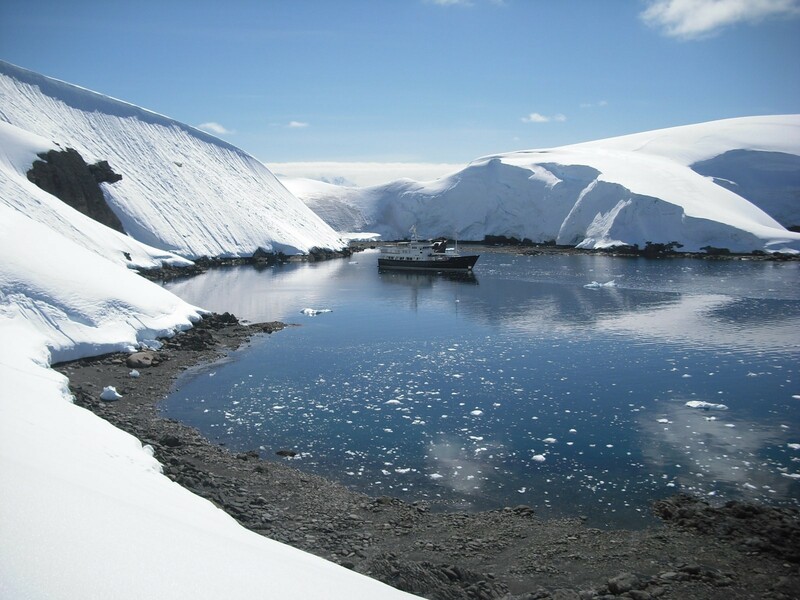 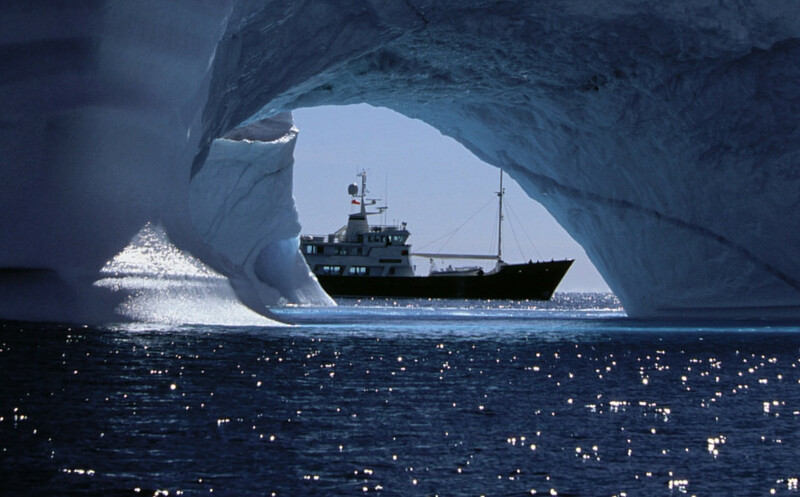 Since her launch PIONEER has proven her worth having voyaged almost 200,000 trouble free miles including the honor of being the first motor yacht to circumnavigate the North American Continent unaided, with a successful transit of the North West Passage from East to West in 2001. 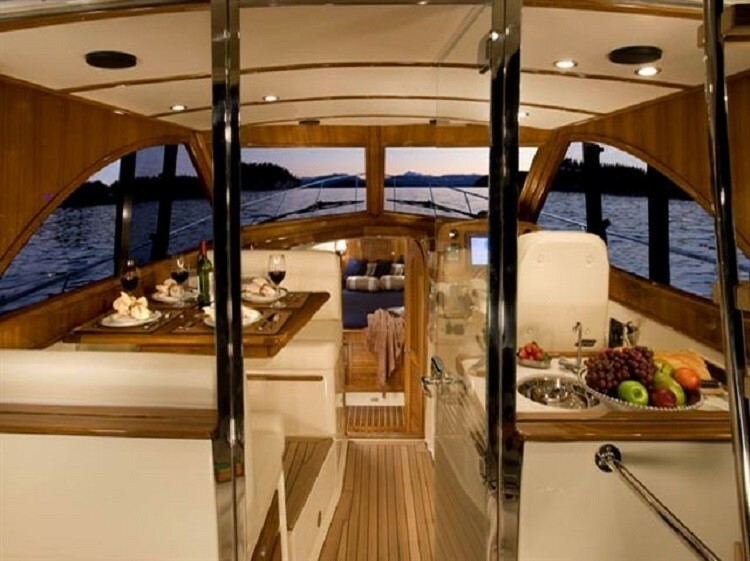 The vessel has excellent construction and engineering and is known to be extremely quiet and vibration free. 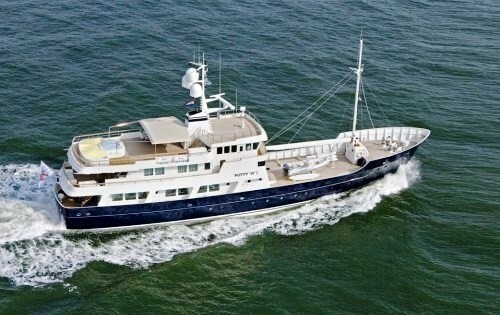 In 2007 she received a major overhaul and rebuilt in the Netherlands. 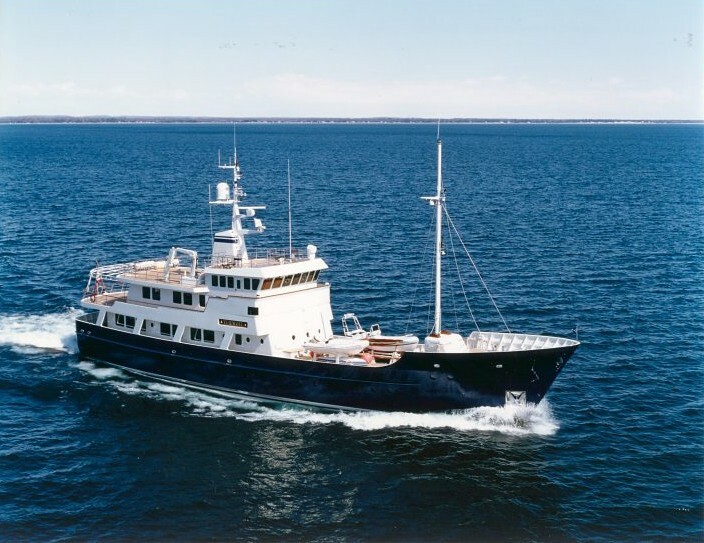 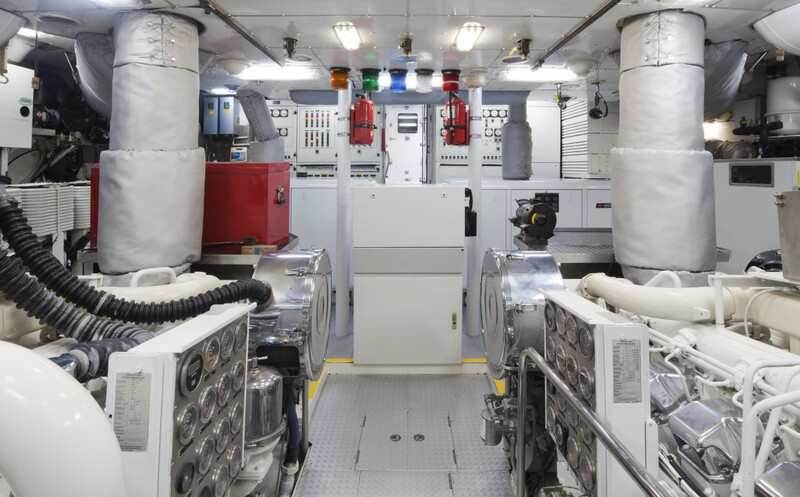 During the refit, a complete new air-conditioning plant was placed in the engine room, all fan coil units were serviced and modified with mufflers in the fresh air system, new zero speed stabilizers were mounted, and the teak decks were wholly overhauled and 100% newly caulked. 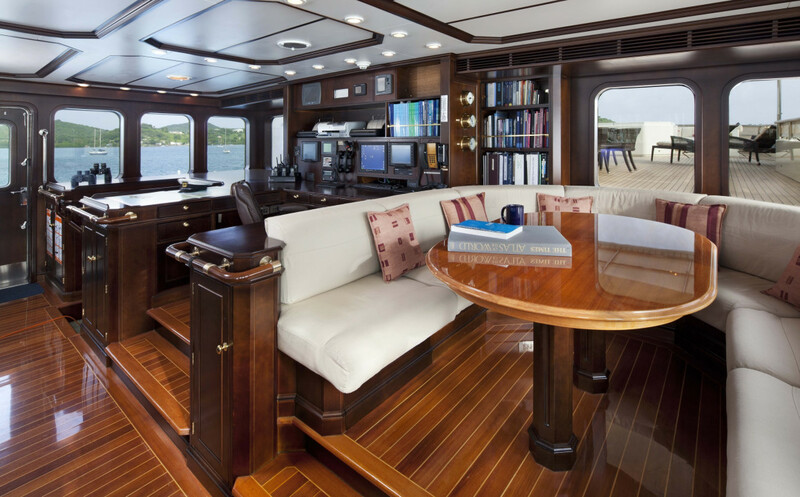 PIONEER’s sundeck was completely modified with new bulwarks, new life raft stowage, teak cap rails and a sun awning. 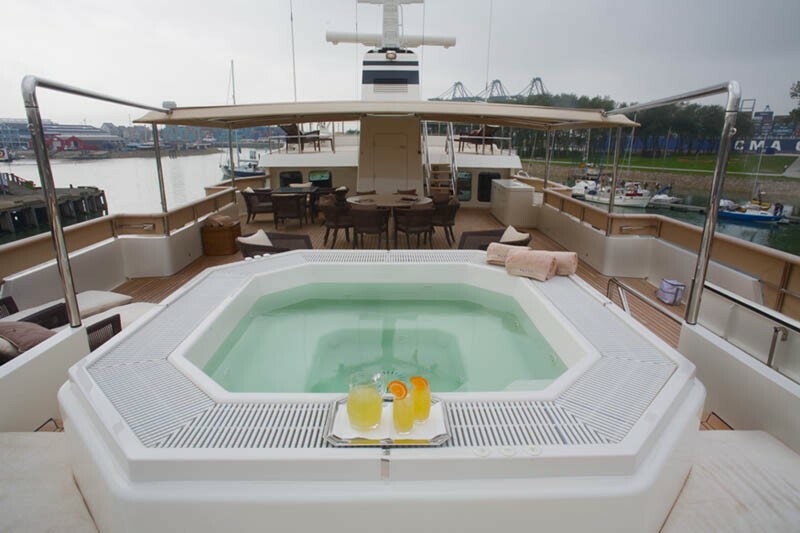 For even more pleasure a sun pad, Spa Pool, bar with grill, icemaker and a fridge were included. 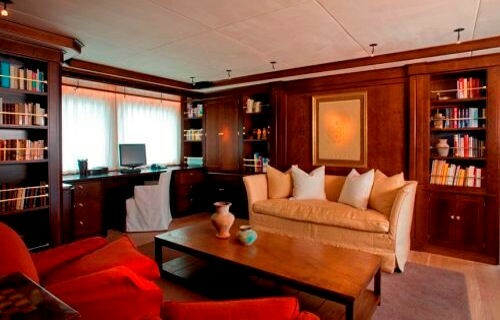 The owners quarters, including the bedroom and bathroom, VIP and guest cabins were completely rebuilt. 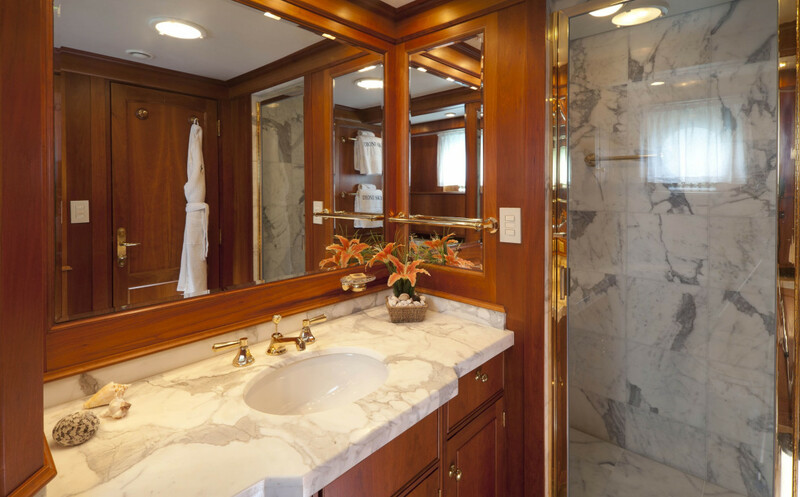 Extra steam showers were added, all areas have been repainted, and the ceilings were renewed. 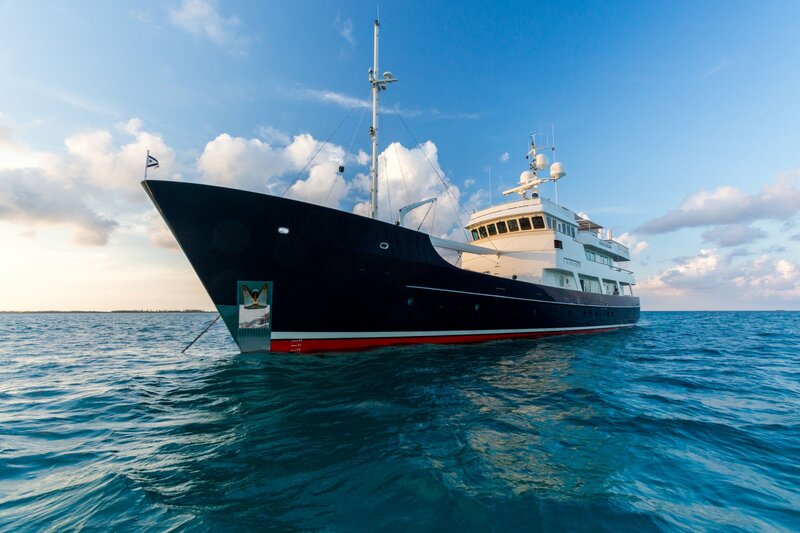 To finalize the refit, PIONEER received a complete paint job. 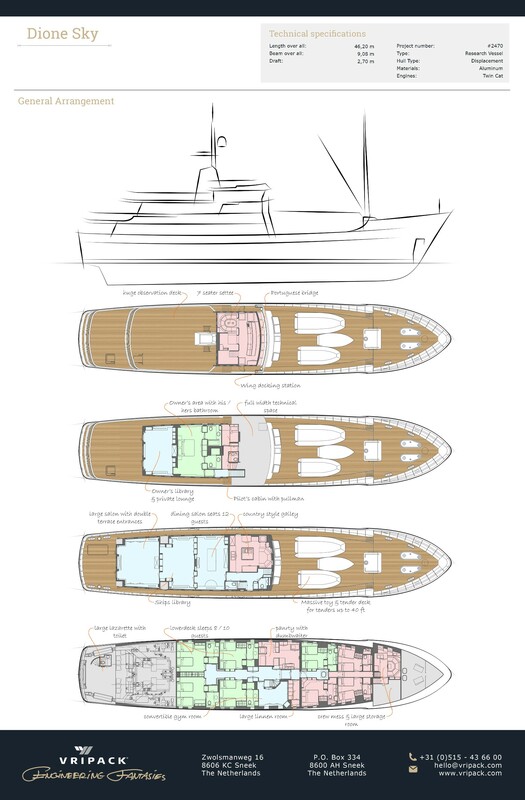 The modifications mentioned above are just a small handful of the total refit. 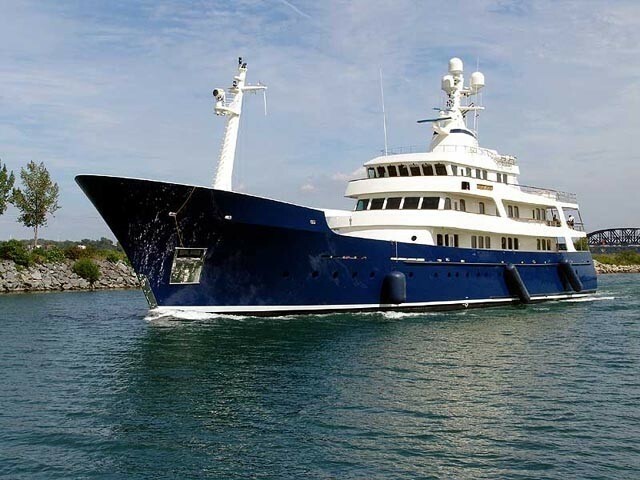 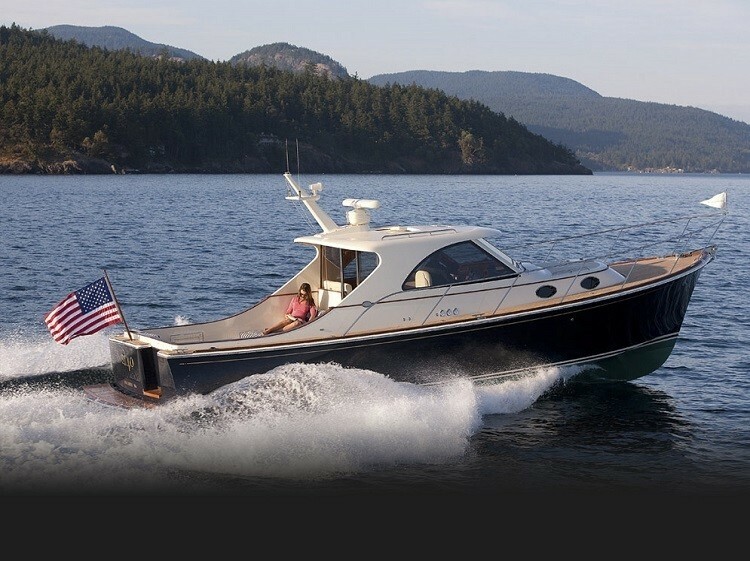 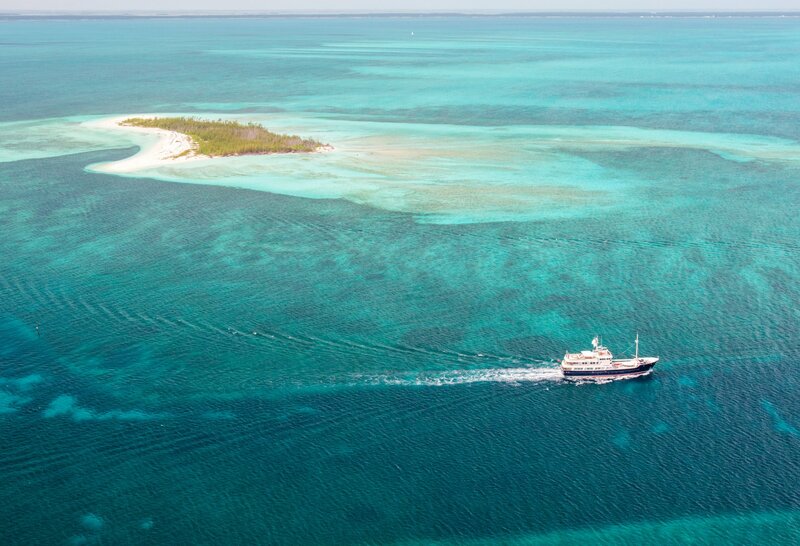 Due to the vessels large fuel capacity she can offer extended cruising. 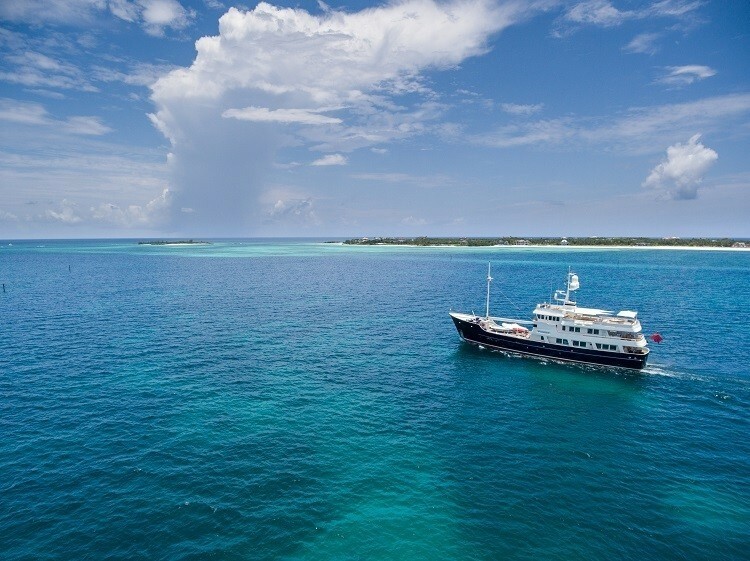 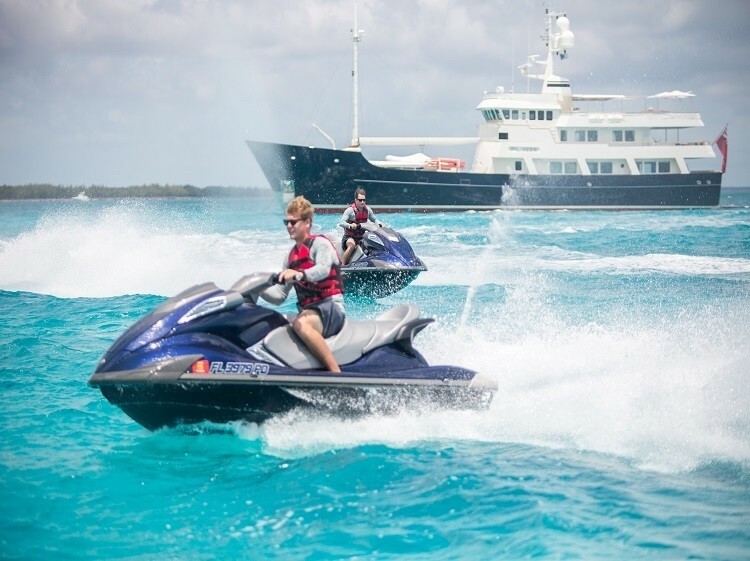 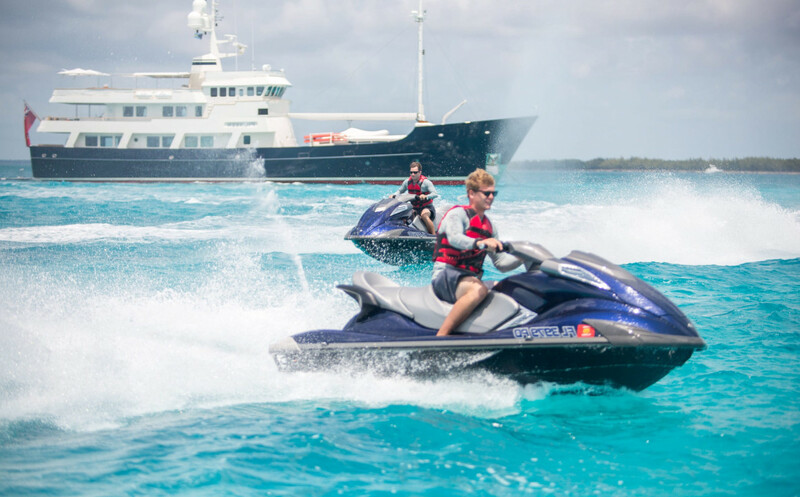 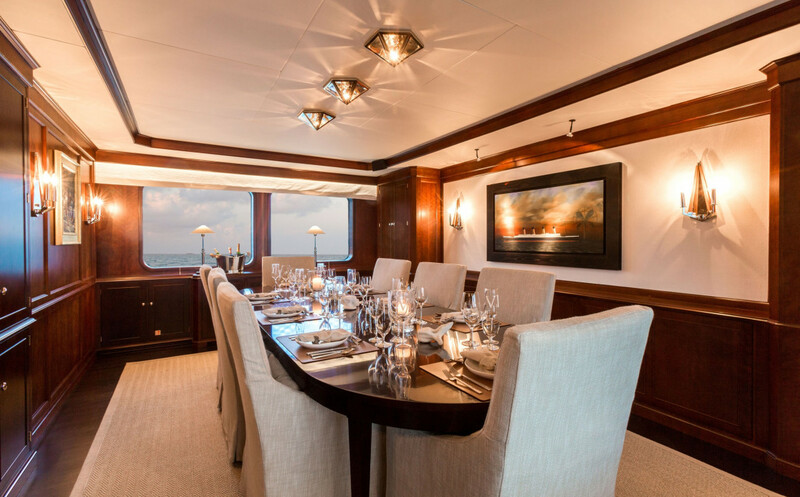 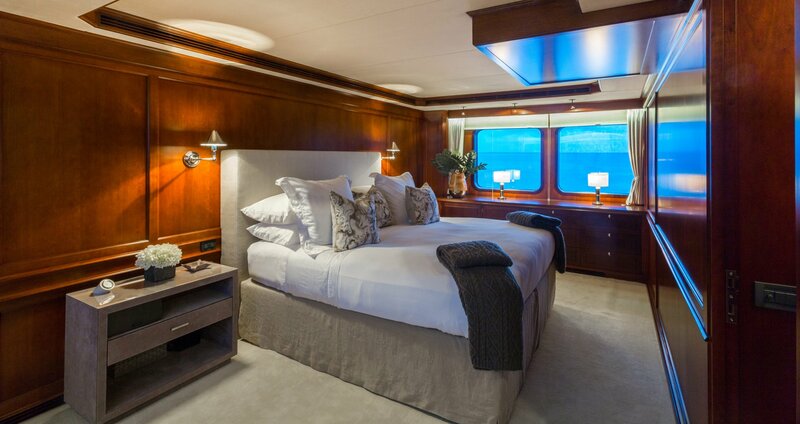 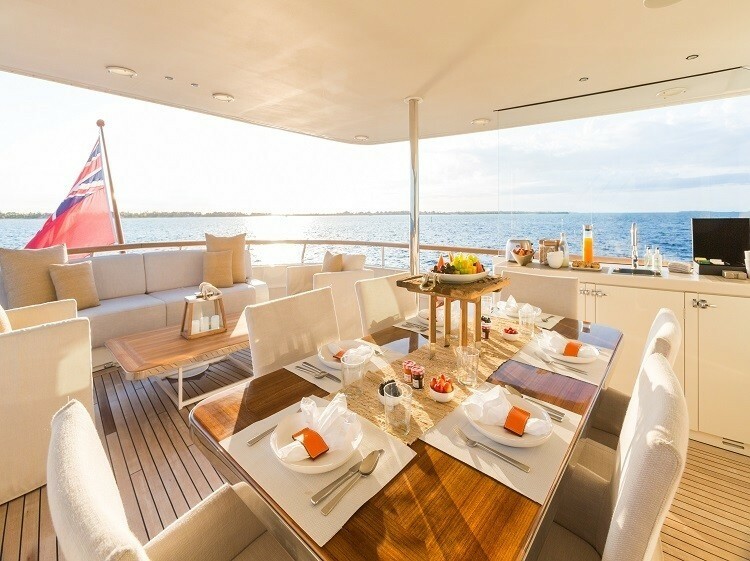 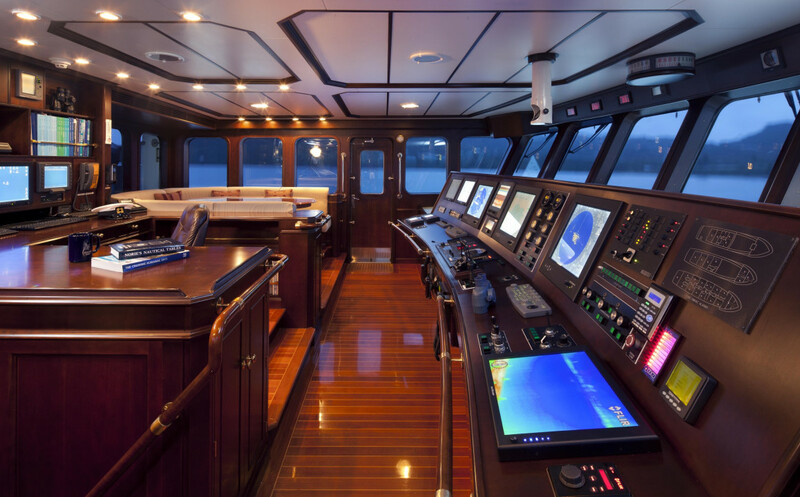 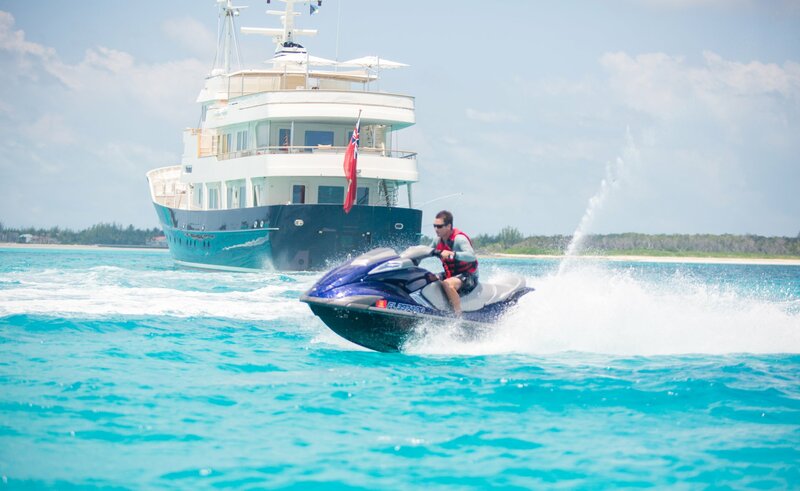 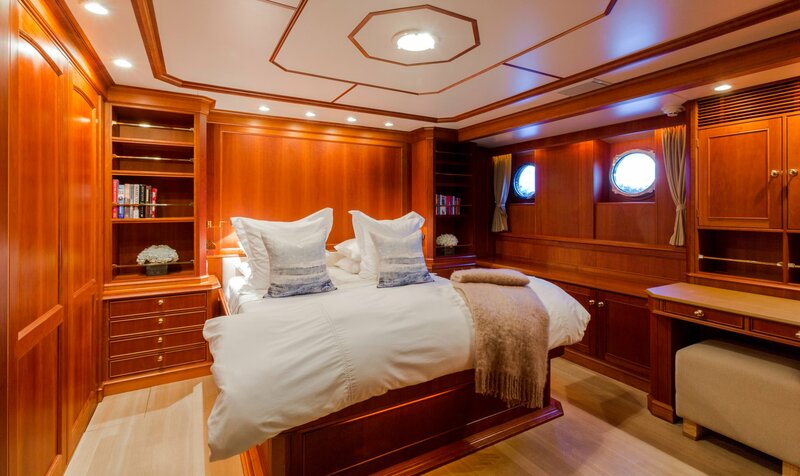 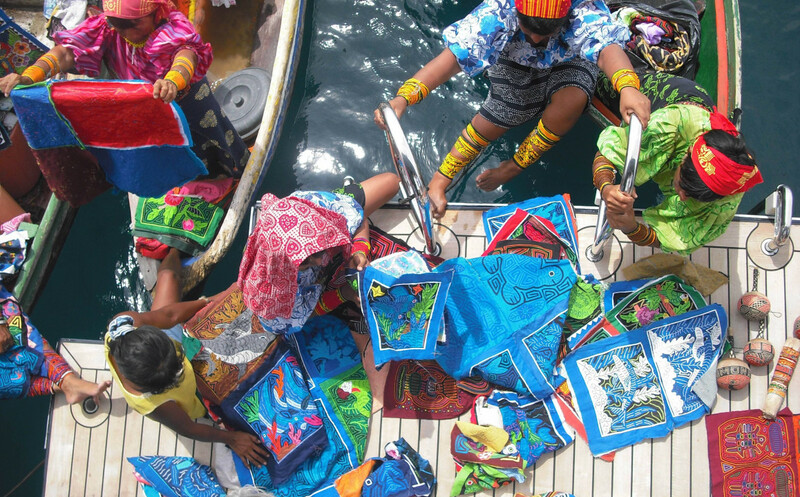 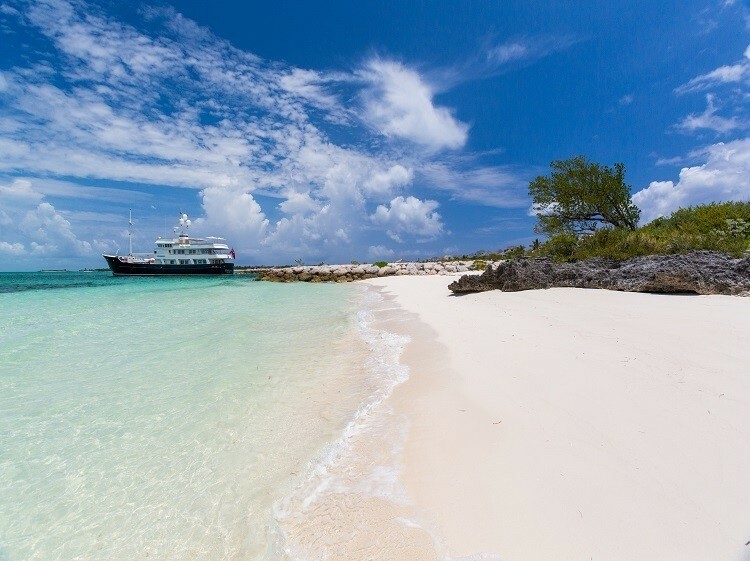 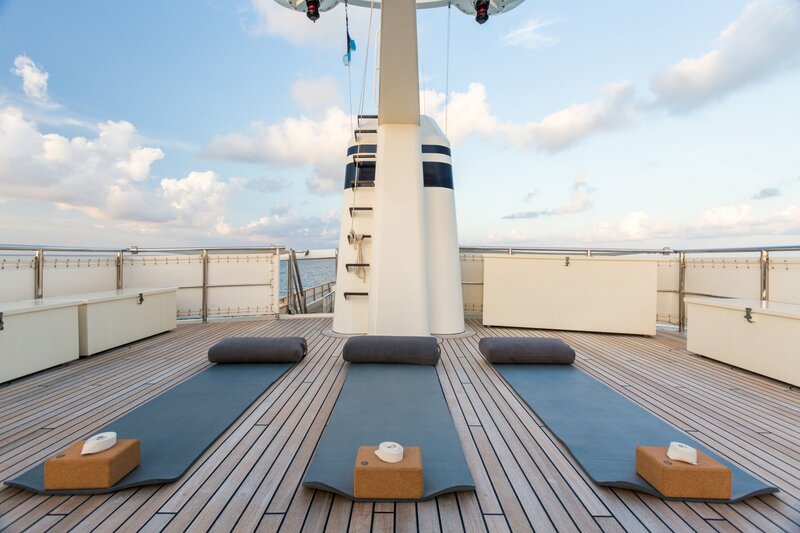 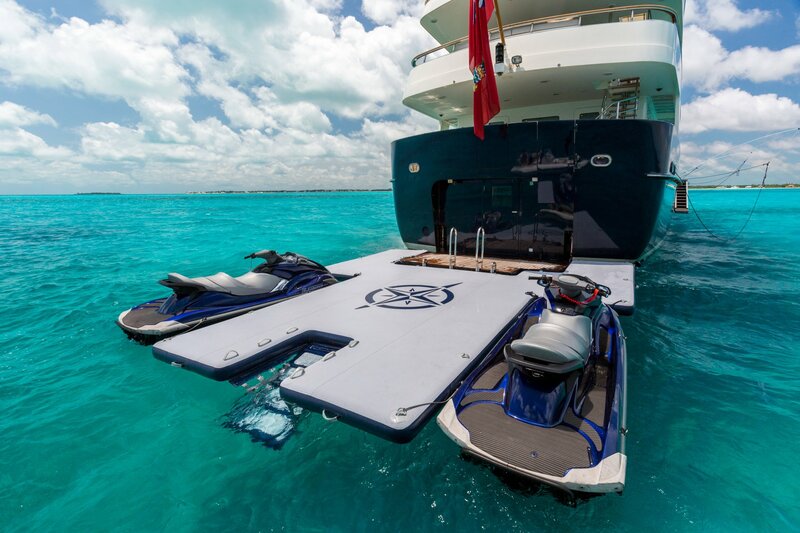 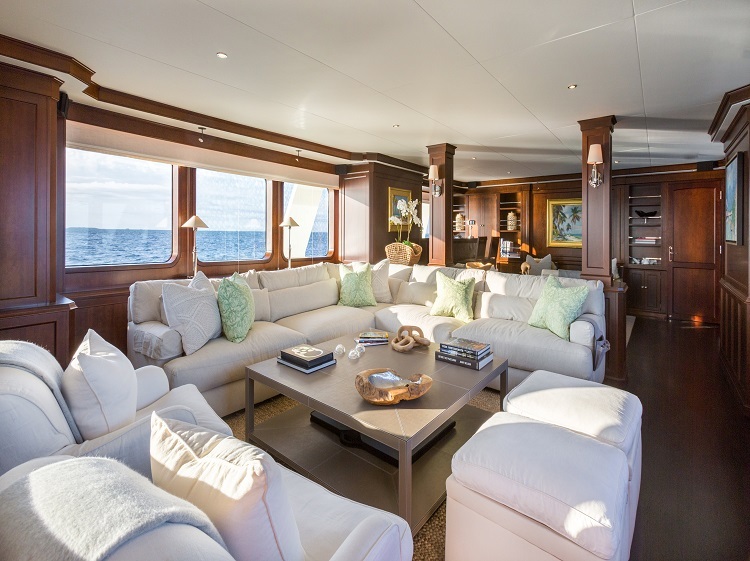 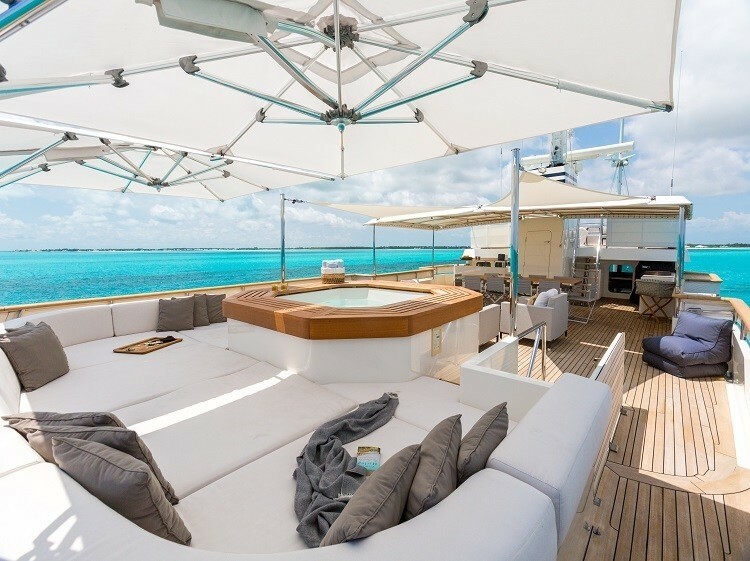 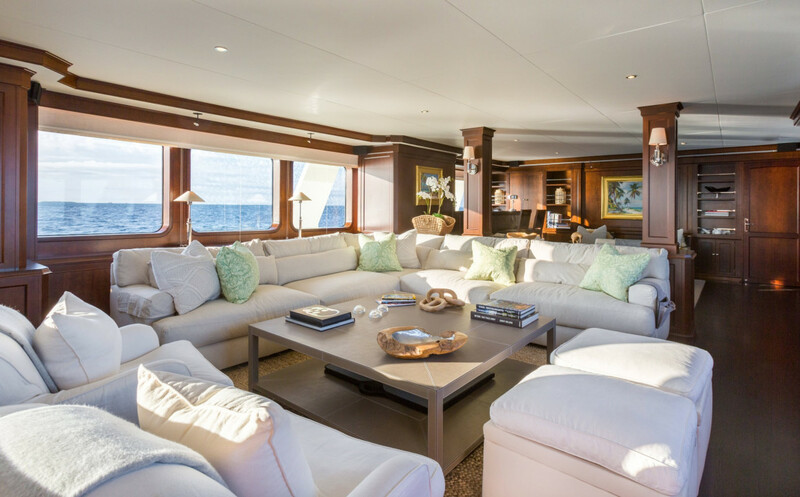 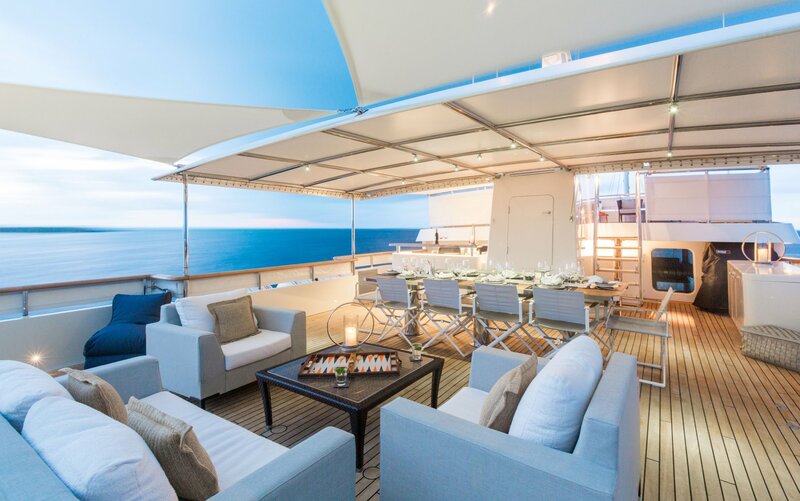 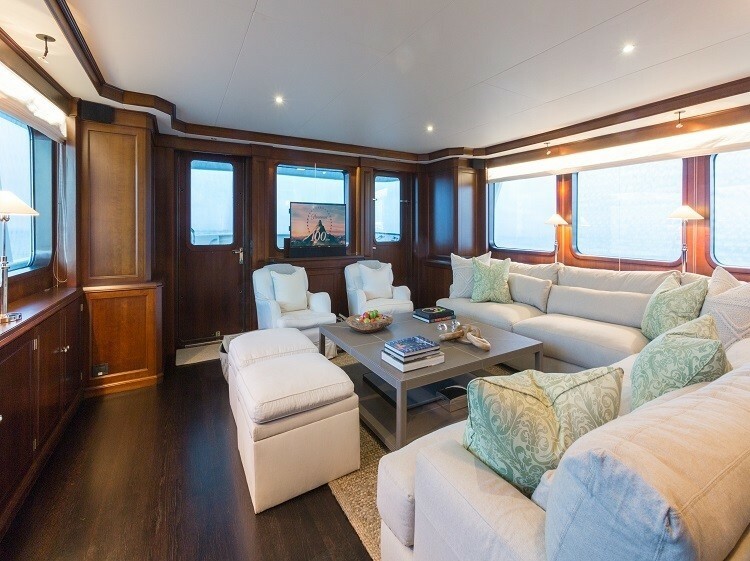 Luxury Motor yacht PIONEER can accommodate up to 10 guests five luxurious staterooms all with en-suite facilities. 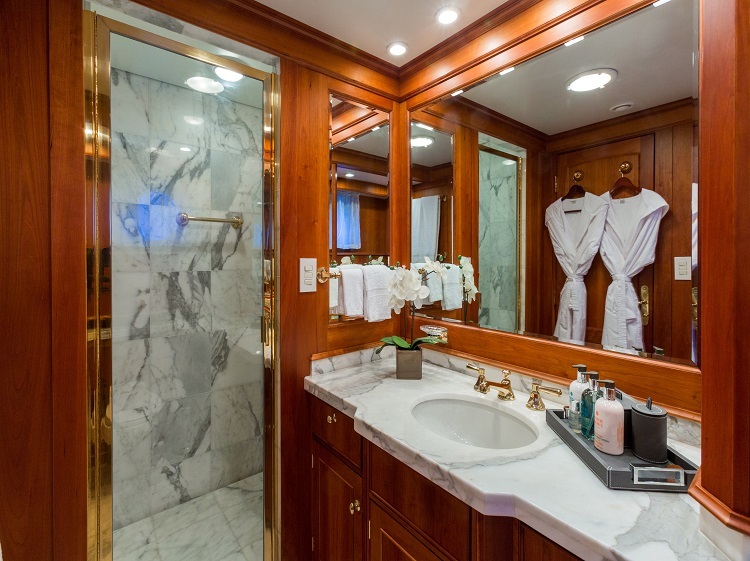 The Owner’s suite has a center line king size bed, two walk in cedar lined closets and two generous shower rooms forward. 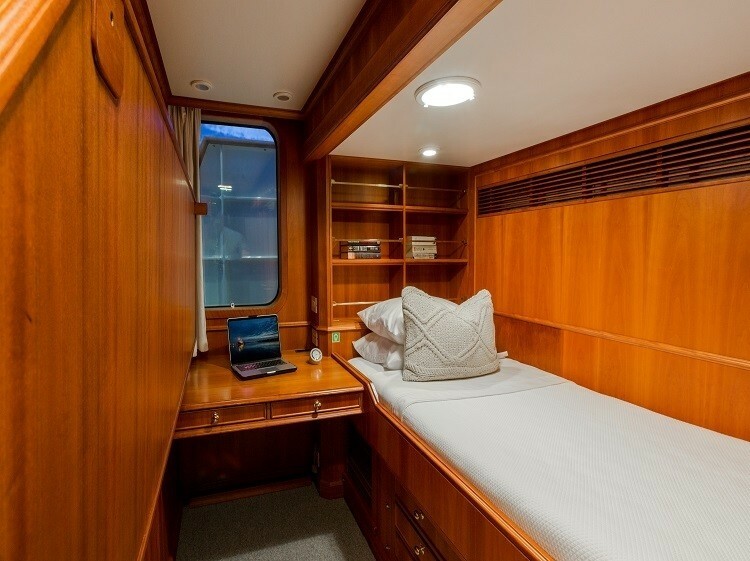 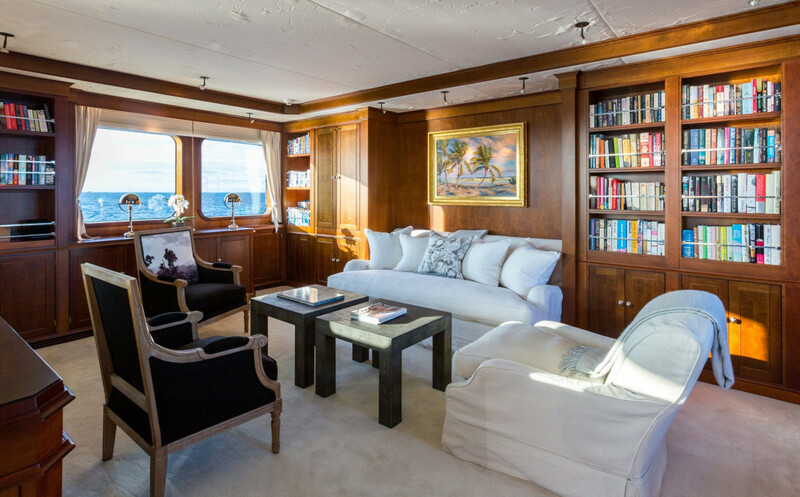 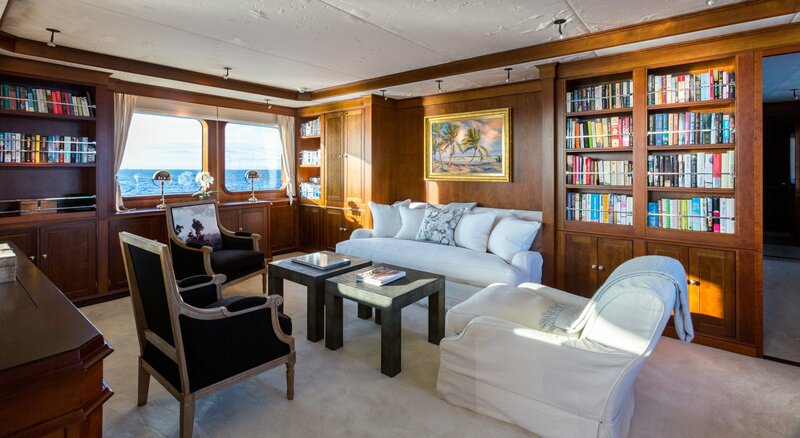 Aft of the Master suite is a private Library similarly finished in American Cherry with built in book shelves, writing table, easy chairs and settee. 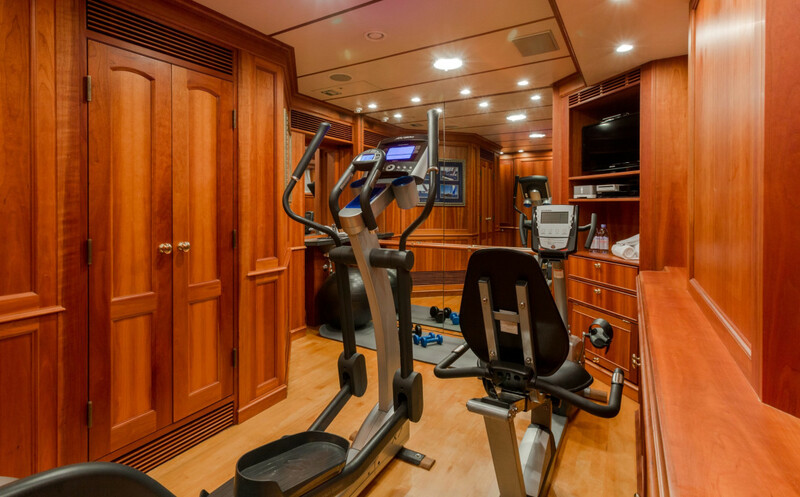 There is a discrete entertainment center with flat screen TV, surround sound with DVD and multi-cassette player enclosed in an oak armoire. 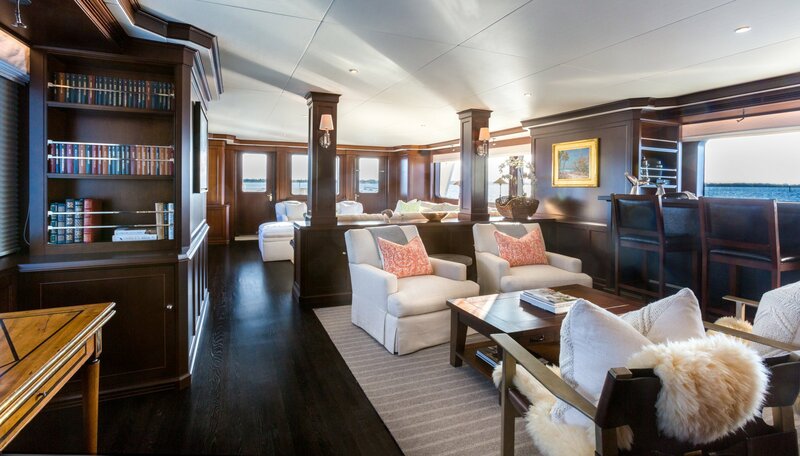 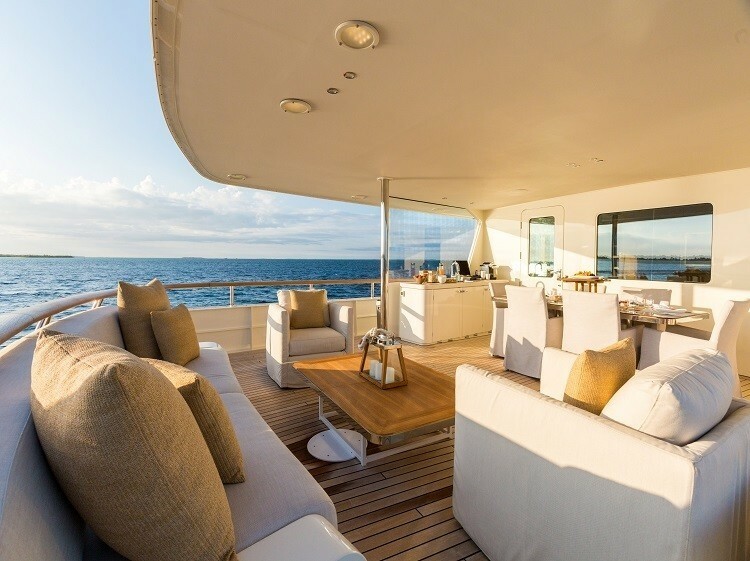 Two doors lead aft to the owner’s Sun Deck which has access down to the main deck and up to the sky deck. 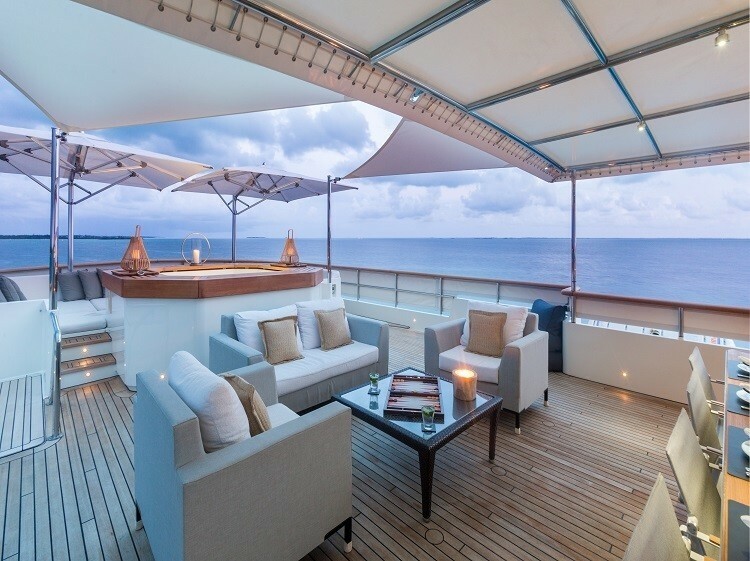 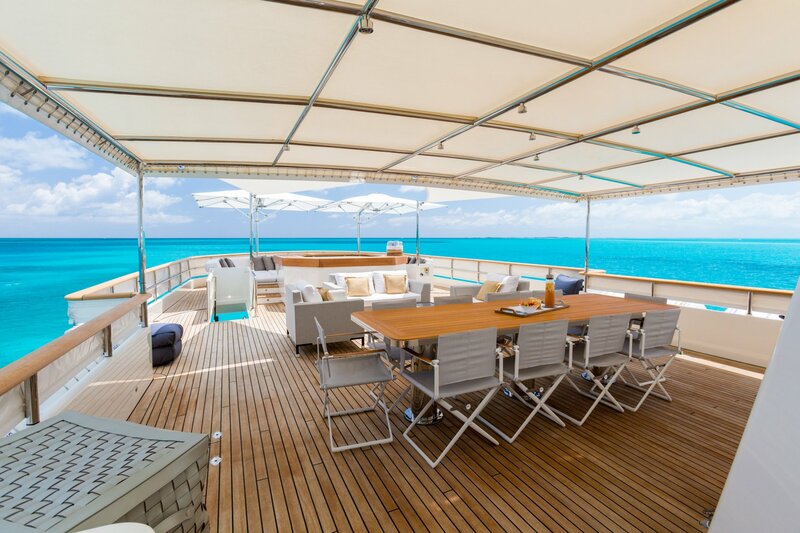 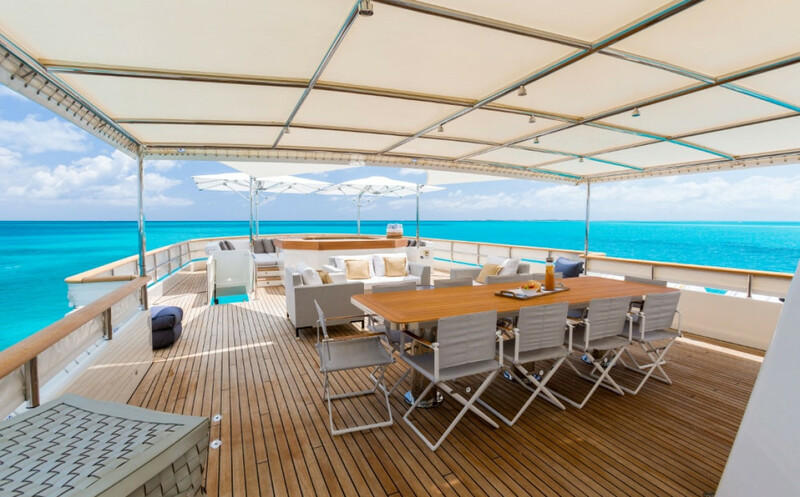 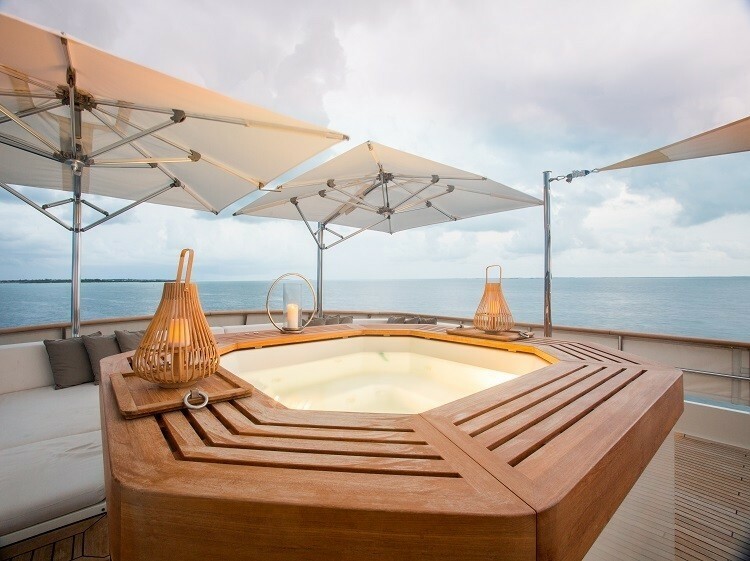 This private area has an oval varnished teak table and seating for 10 guests on teak chairs and loungers, a bar area with sink and fridge with icemaker and stowage for china and stemware. 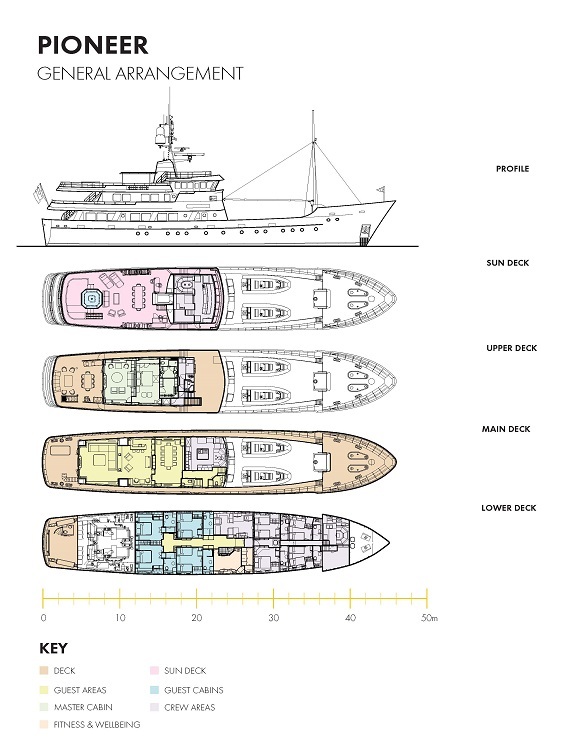 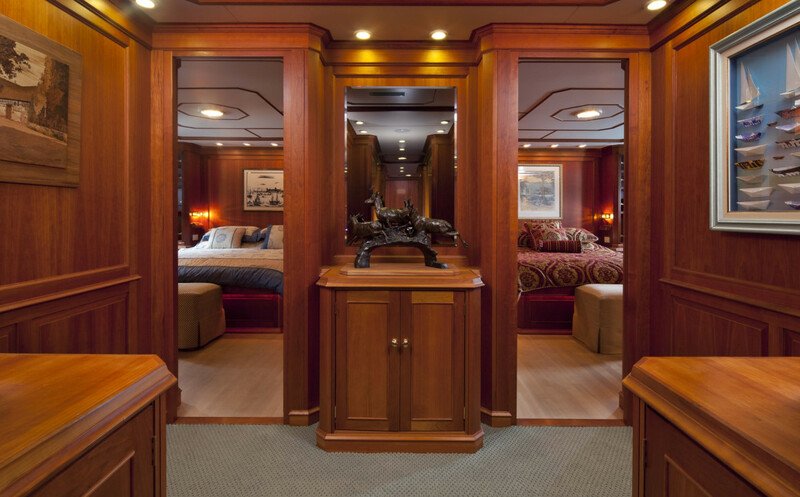 Leading aft through a water tight door is the lower deck guest area which is accessed from the central staircase exiting at the main deck entrance foyer. 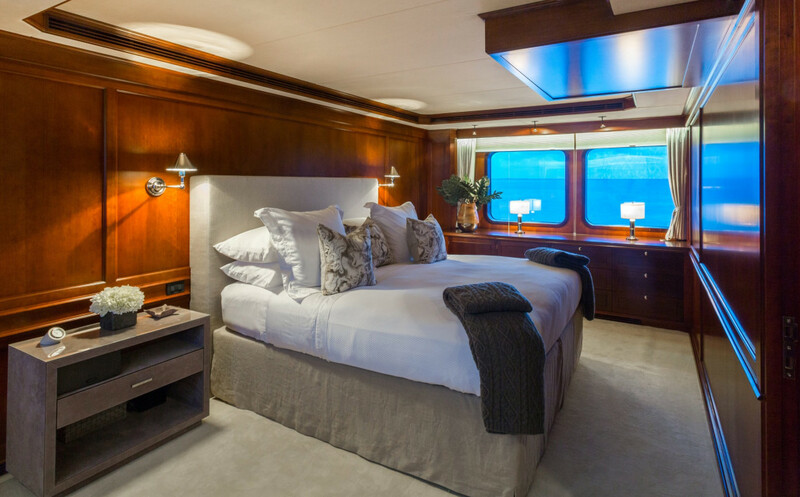 There are the two VIP guest staterooms with queen beds, and two twin bedded (one with an extra pullman bed) similarly paneled and generously laid out, each with en-suite shower rooms in grey marble. 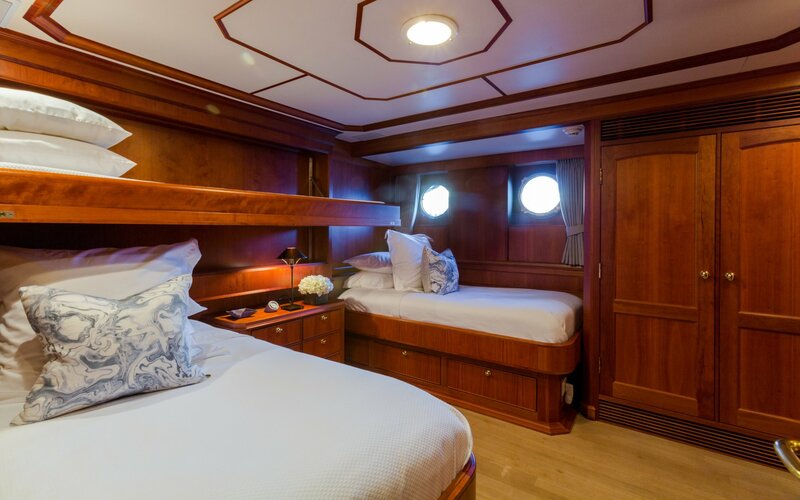 All the guest staterooms benefit from two large deadlights each and one in the shower room, making them light and airy. 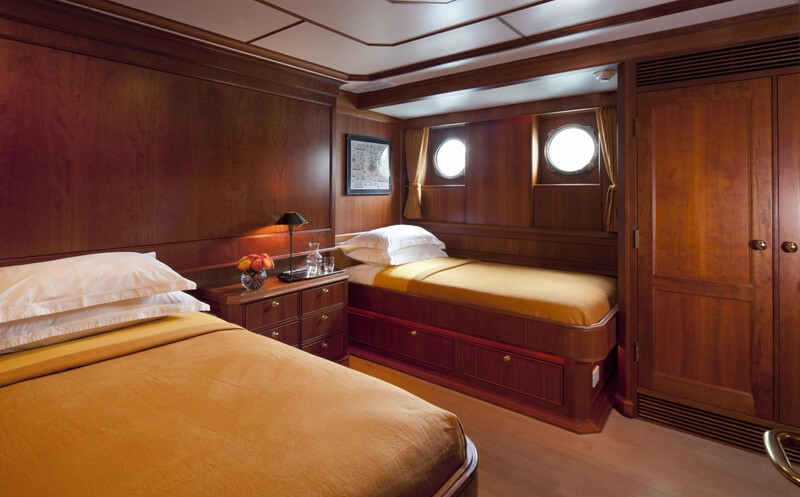 Audio and video equipment, voluminous bookshelves, cedar lined hanging closets and a safe compliment each stateroom.